Participants in Portland Art Museum’s artNOW program. The Portland Art Museum is excited to announce artNOW, a new program for individuals living with dementia and their care-partners, developed in partnership with the Oregon Chapter of the Alzheimer’s Association. On Monday afternoons every other month, visitors are welcomed into the Museum while it’s closed to the public for a creative two-hour experience. ArtNOW is designed as an opportunity for individuals living with young-onset or early to mid-stage dementia and their care-partners to connect with the Museum and its collection, each other, and other individuals who have similar experiences and interests. Each program is organized around a theme, such as how artists use color to express emotions or ideas. During an hour-long conversational tour in the galleries, specially trained docents or staff focus on what visitors observe in a work of art and visual analysis—always focusing on the present moment. On a tour over the summer, the group reflected on a still life in the European galleries, discussing the flowers that were included and what they might symbolize, then created a flower arrangement together using images from magazines and books. Afterward, the group moved to the Kinney Classroom for refreshments, discussion, and another art activity: creating replicas of insects found in gardens during summer, or in the paintings in the Museum’s collection. Some took their creations home; others donated their artwork to the walls of the Kinney Classroom, which is transformed into an Art Pub each Friday night. 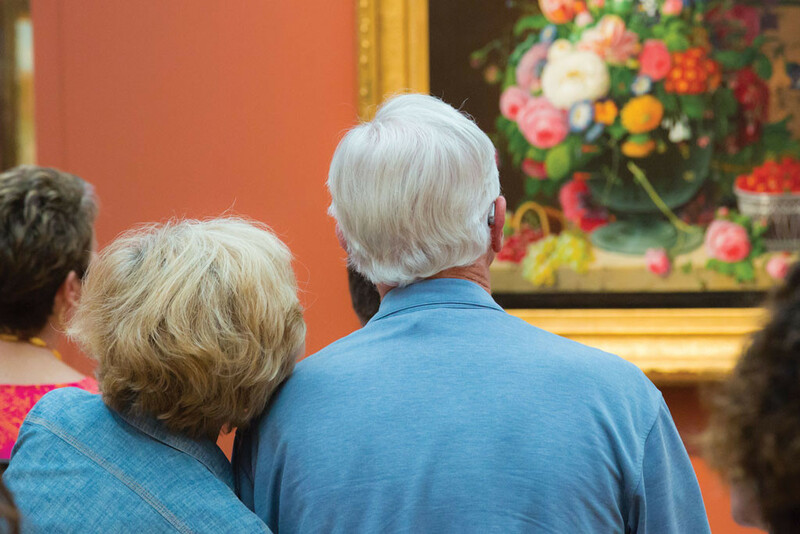 The artNOW program was developed through a partnership with the Oregon Chapter of the Alzheimer’s Association, which has provided training to docents and staff, valuable guidance and expertise, and significant staff support to the program. Staff from the C. Rex and Ruth H. Layton Aging and Alzheimer’s Disease Center at OHSU and the Companion Art Studio were meaningful consultants on the project. We are now accepting reservations for 2019 sessions. The program will be held on May 7th, 14th and 21st, and June 4th from 12:45 to 3 p.m. Space is limited and advance registration is required. For more information and to register, please call the Alzheimer’s Association’s helpline at 1-800-272-3900 and request to learn more about artNOW.